St Paul's Church was located at the northern end of Morice Street, facing Morice Square from the east; on the spot where it once stood there is now parking for a row of cars. St Paul's parish was formed in 1846, out of the mother parish of Stoke Damerel; the foundation stone for the church was laid three years later, in July 1849. The parish of St Paul's served the nearby community of North Corner; the congregation attending from Cornwall Street, Cannon Street, Queen Street, King Street, Ordnance Street and Morice Street. St Paul's Church was severely damaged in the bombing of WWII; the skeleton structure that remained was used as a playground by local children for many years after . The building was eventually demolished in 1958. In addition to the church proper, the parish constructed two community buildings, both at North Corner. The first, designed by James Piers St Aubyn, was the 1860 building that had started out as St Paul's Parochial School but eventually became Cornwall Street Girls' School. The second was the Mission Hall, constructed in Cornwall Street Ope in 1883. The mission was used initially as a Sunday School, but following WWII it began being used for a variety of community activities. In 1983 it took the name of The Armada Centre and was formally opened by Princess Anne as a community centre. The Armada Centre was demolished in 2000 as part of the North Corner rebuild. Following the church's demolition in 1958 the parish of St Paul's was absorbed within the parish of St Aubyn. For those researching baptisms, marriages, etc, Plymouth Record Office holds some of the registers. Olive Amelia, daughter of Charles Williams and Mary Elizabeth Dew. Elsie Jemimam daughter of Peter and Ellen Murry. Alice Maud Susan, daughter of William Artheru and Eliza Shean. Hilda, daughter of Henry and Emma Jane Shaxon. John Richard, son of George Frederick and Mary Anne Jones. Lilian Gladys, daughter of Samuel Bassett Ellis and Rose Kate Dyer. William Arther, son of William Newman and Amelia Elizabeth Tucker. Harry Sampson Milford, son of William Henry and Mary Ann Trout. Alfred Edward Samuel and Lilian Mary Elizabeth, children of Alfred Edward and Louisa Herring. Margaret Louisa, daughter of Charles Henry and Margaret Jane Kaboon. William Ronald, son of Williamd and Florence Eliza Kellow. Ernest Norman, son of Sidney and Amy Emma Denley. Samuel John Ellender and Bertha Gould. The author and her brothers and sisters were some of those children. 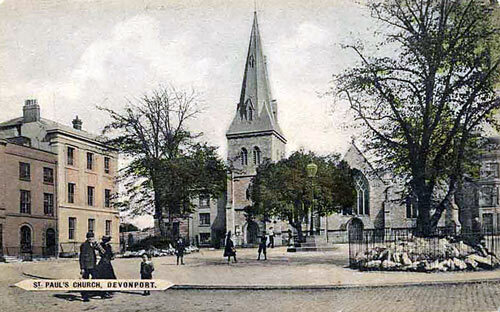 Following WWII, until the early 1960s, Devonport had numerous 'bomb sites' where local children played. It was a common activity. Life was of a different time/culture then, parents never minded this activity, neither did they chastise their children for playing on the ruins. 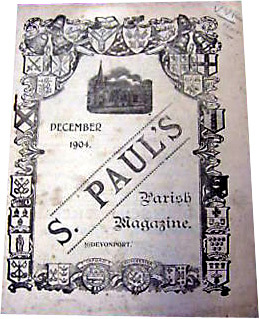 The December 1904 parish magazine published by the church, transcribed by the author in 2010.